The Ducks fell just short of the cup with John Gibson injured and journeyman Jonathan Bernier in net. Without their number 1 the Ducks, previously dominate, just couldn’t get past the Predators and Pekka Rinne. With the expansion draft coming up and injury news flying out of Anaheim it’ll be interesting to find out if they’re willing to leave someone unprotected to see if the injury will scare the Knights off. The #16 seed in the Stanley Cup playoffs are currently 3 wins away from being Stanley Cup champions. As much as some people want to give all the credit to the crowd in Nashville, the real heroes are the blueline. Holding both Crosby and Malkin shotless in Game #3, their excellence can be seen. Protecting 4 defensemen means that a quality forward will be lost by Nashville. Vegas will have plenty to chose from when the time comes. My original plan was to protect Anderson and Karlsson and leave everyone else unprotected. But the rules don’t work that way. Somehow Guy Boucher dragged the Senators into the Conference Finals, a fine feat considering he has but two competent players on the roster. Anderson and Karlsson were the first to be protected as without them Ottawa would crumble into dust. If the front office could convince Phaneuf to waive his NMC then he might make an interesting target for Vegas. But as it stands it’s gonna be slim pickings for the expansion new boys. 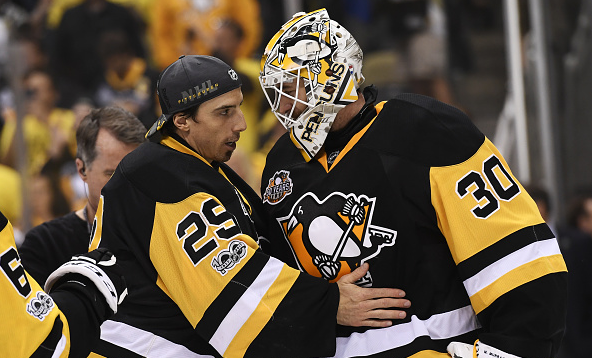 If Marc-Andre Fleury could be persuaded to part ways with his NMC then he’d be a great addition to the Vegas Golden Knights while solving a big part of the Pens’ salary cap issues. Whoever ends up getting protected, I’d be very surprised if Vegas didn’t pick up one of their goalies from Pittsburgh. The Pens have a lot of big names who’ll be out of contract very soon: Chris Kunitz, Nick Bonino to name but two and need to tie up some big contracts.